A baby’s skin is tender and delicate; so much as a stroll down the beach could lead to overexposure to the sun. Sunburn is a common condition during sunny days which must not be taken lightly. Here are few tips and tricks to handle a sunny day like a pro. Sunburn is a condition caused by overexposure of the skin to sun’s harmful UV rays causing redness, burning, and inflammation of the skin. In severe cases of sunburn, the skin may turn to blisters or develop a fever. How Does A Baby Get Sunburns? Direct Sun Exposure: Babies are more at risk to sunburns than the grown-ups. Even if they are exposed a few seconds to the sun, the harmful sun rays can pave the way to the sunburn in babies. A cloudy day does not mean the absence of UV light. 70% of UV rays can still get through on a cloudy day. Snow reflects up to 80% and sand 20% of UV rays. Avoiding Sunscreen: Most new mothers underestimate the benefits of wearing sunscreen. 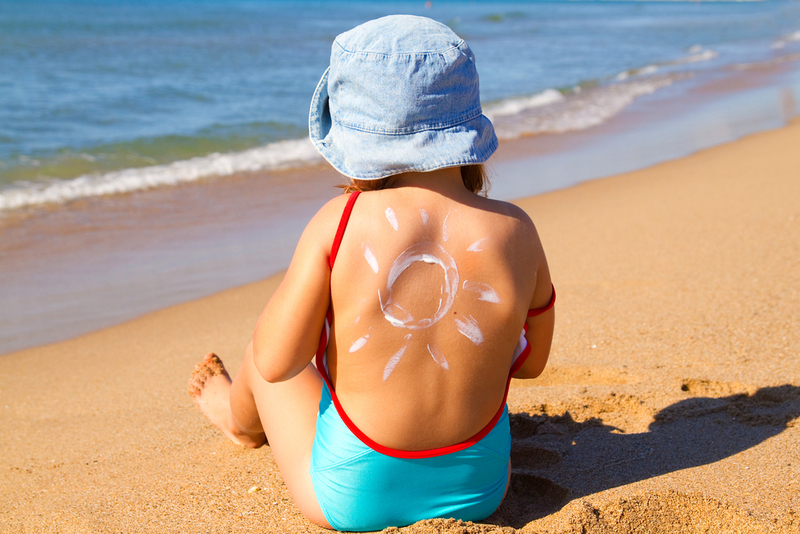 Not wearing a proper sunscreen is the most common cause of sunburn in babies. Lack Of Proper Shading And Protection: While taking the baby out for a stroll, a minimal use of hat or umbrella can protect the baby from sun exposure. Spending Too Much Time Under The Sun: The sun’s rays are at its peak between 10 am to 4 pm. It is best to avoid venturing out with your baby during the peak hours. Light Skin: Babies with lighter skin tones are more prone to get sunburnt as they have less melanin. The level of tolerance in light-skinned babies is lesser than babies with a darker tone. Previous Skin Condition: Babies with pre-existing skin conditions like eczema or lupus are more sensitive to harmful UV rays making them more susceptible to sunburns. Can Babies’ Eyes Get Sunburned? Photokeratitis, or the eyes exposure to sun, is a condition that affects the cornea leading to the discomfort of the eye. This condition causes irritation, redness, blurry vision or sensitivity to bright light. Using proper UV blocking sunglasses can protect babies tender eyes. How To Tell If The Baby Has A Sunburn? There are classic signs of sunburn to look out for after a day out on a sunny day. When To Visit The Doctor For A Baby’s Sunburn? Blisters within the first 24 hours after sun exposure. This may be a second-degree burn that requires immediate medical attention. Severe exposure to sun’s rays may lead to sunstroke. If the baby vomits profusely or loses consciousness, then seek medical help immediately. What To Do If A Baby Gets Sunburn? Apply cool water compress for 15 minutes and repeat up to four times a day. Give a cool refreshing bath with mild soap. However, pat dries the skin and do not rub against the rashes. Keep the baby hydrated. Offer lots of water and fresh fruit juices to drink. If your baby is less than 6 months of age, breastfeed more than usual. Dress the baby is loose-fitting cotton clothes. Keep the baby rested in a well ventilated, cool room. Refrain from venturing in the sun again till the baby recovers completely. If the baby has mild fever or pain, consult your pediatrician before administering any medicines for sunburns. What Not To Do If A Baby Has A Sunburn? Do not pop the blisters. This could cause soreness and infection in the affected area. Do not use petroleum or alcohol-based products. Refrain from using first aid creams like benzocaine or lidocaine as they aggravate skin eczema. Avoid scratching or peeling skin. However tempting it may be, it is best to let the skin peel off naturally to avoid scars. Abstain from venturing out in the sun until the baby recovers completely. How To Prevent Sunburn In Babies? Minimize Sun Exposure: The sun’s rays are strongest between 10 am and 4 pm. Try to avoid venturing out with your baby during peak hours. Use Sunscreen: There are umpteen brands of sunscreen in the market. Choose wisely. Look for products specifically made for children. Choose a minimum of SPF 15 for regular use and SPF 30 to 50 for harsh days. Look for a waterproof sunscreen and do a patch test on the baby’s skin to check for tolerance. Apply 15 minutes prior to stepping out in the sun and reapply after a couple of hours to ensure good coverage. Dress Wisely: Opt for airy, light cotton clothes. Use hats with brims and back flaps to protect eyes, face, and neck. Use UV blocking sunglasses to protect their delicate eyes. Carry Enough Fluids: It is best to keep the baby well hydrated during a stroll out in the sun. Keep offering kids light drinks or plain water to keep them hydrated. Sunburns are not life-threatening. However, the pain and agony caused by sunburn can be avoided. A few precautions can make a sunny day enjoyable for both the mother and baby.